We deliver HMI/SCADA solutions of FactoryTalk View® from Rockwell Automation. This series of solutions includes an application generator both for simple control applications on a stand-alone computer, and for powerful HMI applications in a client-server and hot backup configuration. The HMI product series has been installed with great success in dozens of leading industrial plants in Israel thanks to built-in mechanisms that help manufacturers track and control production processes much more easily. The HMI software offers a set of built-in object libraries which simplifies and shortens the application development and delivery process. Detailed specification of the customer needs, and writing functional specification (FS) documents specifying the work processes supported by the software. Implementation of the software system, and preliminary tests by the company’s quality assurance team before the integration stage. Installation at the customer site, system integration and testing, and supervision and training of the customer in the initial integration stages. We supply all-inclusive solutions incorporating HMI-control systems, communications infrastructures, and interfaces to the ERP systems. 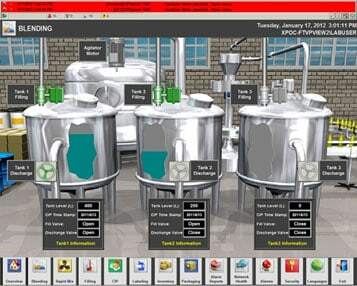 FactoryTalk View Site Edition -SE software, previously known as RSView SE, a software package for enterprise HMI applications. The package supports a distributed configuration, from an individual workstation to implementations based on servers and multiple end-user stations. The package is widely used in Israeli industry in food and drug plants and in process control, etc. FactoryTalk ME software – for the production line or machine level. FactoryTalk Studio for design and development of HMI projects.